New York City, you’ve disappointed your own state and the nation, if not the world. Now, the cities in New York state are more conservative and less informed than the rest of the state? New York City, Buffalo, Syracuse, and Rochester failed Tuesday. Hillary is the most hawkish candidate, even more than Trump or Cruz. Her record is clear. She is a warmongering corporate politician who is against progressive policies. You can’t both claim to be liberal and simultaneously support Hillary. Yes, she can be effective and get the job done for her donors, but not for the public. Throughout her career she has been wrong. While Bernie marched with Martin Luther King Jr., she campaigned for Goldwater. She has campaigned for some of the worst policy decisions since Jim Crow. From mass incarceration, the Patriot Act, the Iraq War, to NAFTA, she has been wrong and behind. She only came out for gay marriage after it became embarrassing for her not to. She has been wrong or behind on the issues throughout her career. She’s not a leader. All the polls show Bernie as being more electable nationally. So, even in terms of strategy, it’s a fail. Sure, voting for Hillary is understandable when you have no other choice. But, this time we had another choice, and we failed. ● Love exceeds . . .
● Love surpasses . . .
● Love outshines . . .
It’s too soon to give up. If Sanders takes New York on the 19th, he will probably be our next president. And then, real reform will be possible. Bernie Sanders has been right for decades. Hillary has been a Corporatist for decades. Both of their records are clear. From the crime bill to welfare reform, Hillary Clinton devastated black America. Draw the line between elected officials who represent private corporations, and our public representatives who actually represent the public. Bernie Sanders & Jill Stein are not afraid to stand up to big multinational corporations and hold them accountable, in favor of human rights. Both, Bernie Sanders and Jill Stein have demonstrated that they can't be bought, and will not be bought by corporate interests. Hillary & the Republicans are already corporate bought! That’s why it’s imperative that Democrats vote for Bernie Sanders in the Primaries. Let the Democrats in Washington know that there will be no vote for corporate interests in 2016. The Choice will be between Bernie Sanders of the Democrats or Jill Stein of the Green Party. 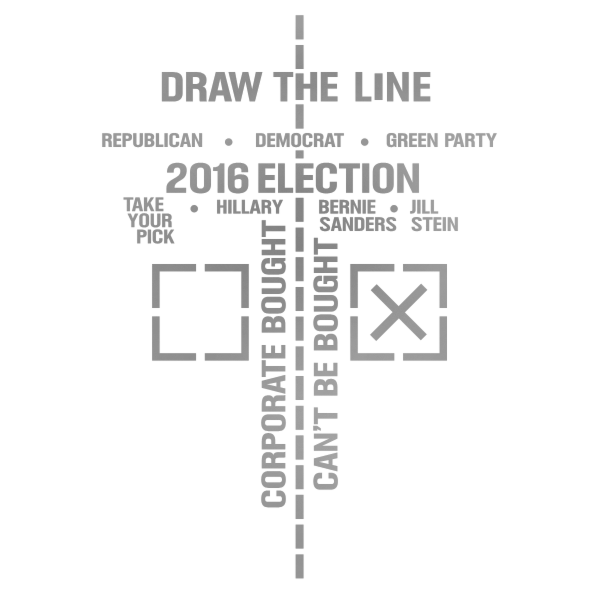 Draw The Line in 2016 ✄--- uResist.org/vote/2016 --- ✔ Make this Election about public rather than private interests, with democratic-socialism.
. . . Love Transcends Hate!